Back in July, I drew attention to an excellent series of posts by Fr. Mark Kirby at Vultus Christi on the debate, in the early twentieth century, between the Benedictines and the Jesuits over the centrality of the liturgy in the Christian life (and more particularly, the life of prayer). Once again, I highly recommend reading those posts for the ins and outs of the debate, but the gist of it is that the sons of St. Benedict strongly promoted the line of St. Pius X, later taken by the Second Vatican Council, that the sacred liturgy is the “fount and apex” of the Christian life, the point of departure for all of the Church’s pastoral activity and the goal in which the Church’s entire mission culminates, while the sons of St. Ignatius were presenting the liturgy as one among many tools useful for personal spiritual growth, with private meditation having a certain pride of place. Illuminating in their frankness, the publications and correspondence associated with this debate deftly expose the principles underlying each side. Fr. Mark also shows how Pope Pius XII attempted to adjudicate this dispute in Mediator Dei by acknowledging the truths held by both schools while fundamentally siding with the Benedictine framework of his predecessor Pius X. Well and good—the armies engaged one another, the battle was fought, and, at least officially, the Pio-Benedictine vision prevailed. 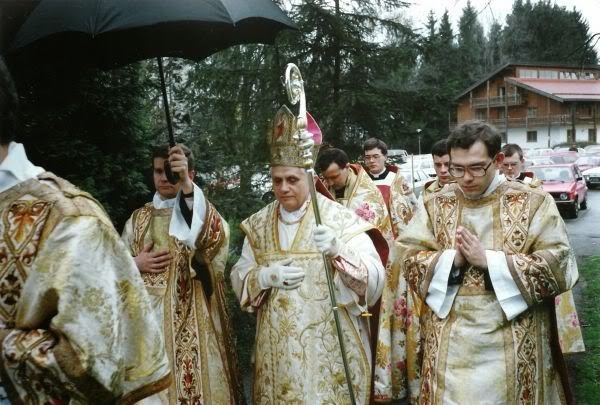 But what about the later history, the post-Mediator Dei period from 1948 to 1970, when the Bugnini liturgy emerged, at first slowly, then more and more rapidly and radically? We often see this immanentization today: people expect the liturgy to conform to their emotional states rather than conforming themselves to an objective cult which in turn conforms itself to God. A couple of months ago I read an eye-opening interview with a fairly well-known priest who dismissed the Tridentine Mass as a kind of idolatry (!) because of the impersonal ritualism of it, the exalted cultivation of form. Everyone was so focused on the rite that they were idolaters of it, he opined. 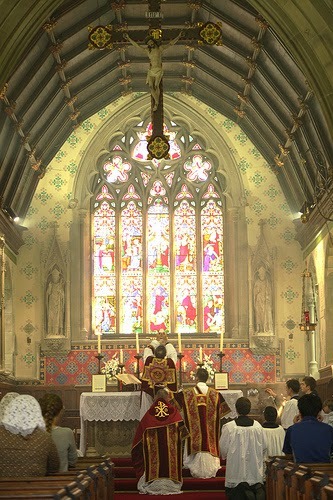 Evidently, he has become too accustomed to the fabricated and ever-changing “meaningfulness” of modern liturgy, with its “personal touches” and “accessibility” and “relevance,” and hence feels chilled by the objectivity and otherness of formal worship in Latin, and the way its ministers and assistants yield their individuality and idiosyncracies to it. The turning around of the altars, celebration versus populum, was not commanded by the Council. In practice, however, the new rite and the new position of the altar are closely associated. We may say that changing back to the original direction will have a beneficial effect. Indeed, the very fact that the bulk of the clergy protests with intense emotions against this return shows its serious necessity; the principal motivation behind the protest is not pastoral care of the faithful, but the psychological distress of the priest. The legacy of the post-conciliar reform is a Benedictine insistence on the primacy of liturgy, fused with a Jesuitized re-conception of liturgy as collective private devotion. It is as if new Jesuit wine has been poured into old Benedictine wineskins, causing them to rupture. The moment of triumph was the moment of disaster, as the very notion of a rite—a formal ritualized act of common worship based on a common orthodox tradition—gave way to a pluralistic, relaxed, malleable, and privatized praxis of variations on a more or less Catholic theme. In short, the Consilium’s exploitation of Sacrosanctum Concilium left us with a volatile mixture that makes genuine reform today much more difficult. Perhaps the most ironic twist in this still unresolved (and now more complicated) debate is the contrast between the current pope and his predecessor. Although not a Benedictine by profession, Benedict XVI closely identified throughout his career with the monastic vision of the all-pervasive centrality of the sacred liturgy, where God and man can meet most profoundly in praise and in communion, at once expressing and accomplishing the unity of the Mystical Body of Christ. At his first general audience in April 2005, he explained that he had chosen the name Benedict in large part as a homage to the Father of Western Monasticism, co-patron of Europe and architect of Christian civilization. With the first Jesuit and overseas pope, we have a pastor who appears to hold many of those modern Jesuit views that Blessed Columba Marmion and other Benedictines, in the name of fidelity to St. Pius X, so stalwartly resisted in the first half of the twentieth century, and that Ratzinger/Benedict himself patiently opposed in his writings and magisterial acts. We have unexpectedly seen the trajectories of the two schools played out before our very eyes in the magisterium, ars celebrandi, and priorities of each pontificate. It is for this reason that the original Benedictine-Jesuit controversy remains of lively interest and massive importance for us today, if we would better understand the trials through which the Church is passing in this age. [*Note] Even when it comes to our personal prayer, we ought to strive for a maximal harmony with the liturgical feastdays and seasons. It would be strange indeed if our prayer life did not register and resonate with the changing seasons of Advent, Christmas, Epiphany, Septuagesima, Lent, Easter, Ascension, Pentecost, which insert us into the life, death, and resurrection of Christ, and the glorious triumph of His saints. As a blogger insightfully put it not long ago: “We should liturgize devotion as far as we can, rather than devotionalize the liturgy, as happened in the last several centuries when low Mass became the norm, public practice of devotions replaced the Office, and some odd feasts crept into the kalendar … Again, let us liturgize our devotion so we do not devotionalize our liturgy.” While I have no problem with a quiet and prayerful Low Mass for weekdays, it does seem regrettable that High Mass is not much more common than it is, although as more clergy are ordained for the usus antiquior, I believe we will see both the Missa cantata and the Missa solemnis more and more as a regular feature of Catholic life.